Valid in all states! Helps you plan & negotiate, guides you through choices, writes a draft agreement ready for review or signatures. Saves you a lot of time and money! DealMaker helps you organize your facts and your thinking, develop options for discussion, and frame any questions you might have for a neutral attorney. It acts as a checklist to make sure you’ve thought of everything, and it produces a comprehensive draft for signatures or final review. For larger or more complex estates, DealMaker will be far more effective when combined with some initial legal analysis and advice, and a final review just before you are ready to sign. Even if you get advice before and/or a review after you make your agreement, you are still way ahead in increased understanding and confidence, and getting advice and a review will cost much less than having an attorney draft your agreement from scratch. PRO version for lawyers, mediators, LDAs, accountants, and financial planners. License valid for three installations. For example: office desktop, home desktop, laptop. If you have a child, you need this software! CalSupport puts an end to argument. 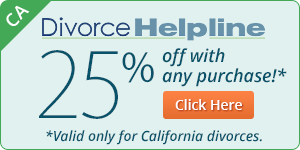 CalSupport calculates correct California guidelines for child and spousal support and includes effective negotiation tools. 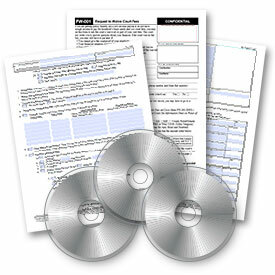 Get the same powerful software used by lawyers for a fraction of the price! Theirs costs up to $500, but CalSupport at $35 is better—easy to understand, easy to use, with help screens and glossary. 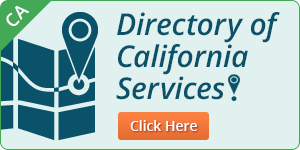 Certified by the CA Judicial Council since 1995! If you pay or receive child support, you need this software! Tracker puts an end to argument! Support Tracker keeps track of support payments paid or received, automatically adds interest due for late payments and calculates total arrears due. If ever there is any disagreement about past-due support, the person with the best records will win. Easy to understand, easy to use, with help screens and glossary. 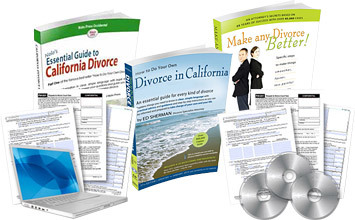 Bargain Packages for a California Divorce. Specially priced packages for a variety of divorce situations. Whether your divorce is going smoothly, is a little bit complicated, is heading for court, or is going to be very difficult, we have a package for you. Solutions for couples both with and without children. Offers may include books, software, and consulting.